I was recommended this book by a couple of different sources and hesitated because it didn't sound like my kind of book. The basic plot, about going to investigate the death of someone who worked for a pharmaceutical company in the Amazon, sounded like a thriller. It was completely different from what I expected. No cheap thriller, this book managed to bring to life an exotic place in a way that seems impossible just from reading a book. It also hinges on the interaction of personalities, and each person is refreshingly distinct from another. Marina, whose only remarkable quality from the outset is that she acquiesces to everything, finds herself following in the footsteps of her co-worker, Anders Eckerman, after his death is announced via a small blue letter. His wife is convinced that he is not really dead, but everyone else takes it as a done deal. Following in his footsteps leads Marina to Brazil and eventually to reunite with her old teacher, Dr. Swenson, whose legend is larger than life. Dr. Swenson is working on replicating a drug found in the bark of trees that prolongs fertility in women. Everyone around her does whatever she demands of them, not just the demure Marina. And when she speaks, she is always several steps ahead of her listener, which adds to her clout. Meanwhile, Marina is having to adjust to so much, including lost luggage, nightmares from the anti-malaria pills she's taking, and avoiding snakes, that Anders' death gets lost in the jumble. But because Marina is so complacent, the transformation from demure to brave is gradual and the reader might not even realize that she has transformed. She just does what needs to be done and takes it all in stride. But even larger than life than Dr. Swenson is the Amazon itself. 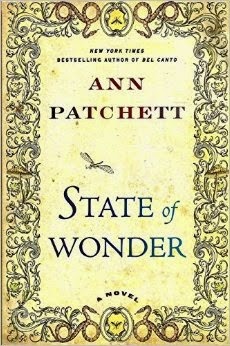 Burgeoning plant growth, trips down a murky river in a pontoon, and the wild ululations of the Lakashi tribe the doctors are studying, make me wonder how Patchett researched this book for such a thoroughly convincing portrayal of a place that is simply astonishing. The writing is exquisite. As soon as she begins by announcing death through the concrete image of a "bright blue airmail paper that served as both the stationery and, when folded over and sealed along the edges, the envelope," I could feel myself sinking comfortably into the story. She continues, "When she saw him there at the door she smiled at him and in the light of that smile he faltered." How many expectations has she captured and then just as quickly shattered through that sentence? It uses my favorite narrative arch, where the story takes on so much day-to-day reality that you almost forget what the quest is supposed to be about and then the climax comes twenty pages before the end of the book. Even though it wasn't my typical kind of book, I found myself saying, "Wow," when I finished it. I'm definitely now interested in reading more of Patchett's work. The drink I would pair with this book would be swamp water, a cure for Marina's fever from a native witch doctor which purged her of her illness. Though unlikely that you'll ever actually drink swamp water, it best represents the unlikeliness of the whole book.